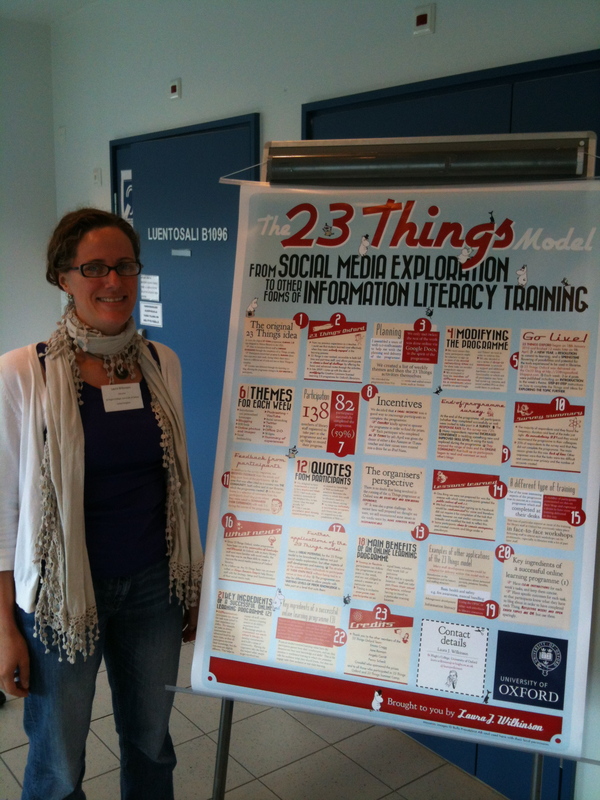 Last week I attended the IFLA satellite conference The Road to Information Literacy – Librarians as Facilitators in Tampere, Suomi/Finland, and presented a poster about 23 Things Oxford. The Moomin images in the poster were used with the kind permission of the trademark holders, Bulls Press. In 2006, the original 23 Things programme, Learning 2.0, was designed by Helene Blowers in the USA. Aim: to introduce library staff to emerging technologies through the completion of 23 things, or tasks. Participants record their progress by blogging about their experience each week, during which there was a focus on a different set of tools and two or three Things to complete. Content was delivered through the Learning 2.0 blog, allowing the programme timing to be self-directed by participants. From my previous experience as a teacher, I could see that students learned most effectively when they were actively engaged in the learning process. 23 Things is user-centred, accessible to both full-time and part-time staff, and allows participants to choose a level of challenge by offering the basic and advanced routes through the activities. In late 2009 I came up with the idea of modifying the Creative Commons licensed Learning 2.0 programme for Oxford’s librarians. I assembled a team of web 2.0 enthusiasts to help me with the planning and delivery of the programme. We only met twice; the rest of the work was done online via Google Docs, in the spirit of the programme. We created a list of weekly themes and then the 23 Things activities themselves. We extended the programme from 9 to 12 weeks and added newer tools, such as Twitter. We were aware that some participants might be reluctant to sign up to some of the social networking sites and for these tasks we avoided compulsory sign-up. We attempted to keep the number of different accounts to a minimum; where possible we used Google and Yahoo! services in order to achieve this. We also decided to run a series of drop-in sessions to provide 1:1 support and additional hardware or computer functionality to which not all participants may have had access e.g. cameras, and sound enabled PCs so they could listen to podcasts. 23 Things Oxford began on 18th January 2010 and finished 12 weeks later on 9th April. A new year, a resolution to commit to learning, and a springtime flowering of possibilities and potential for the tools experienced to be used in libraries. 23 Things Oxford was delivered via the Ox23 blog. Each week, 3 or 4 posts were published including an introduction to the week’s theme, step-by-step instructions on how to complete the Things and ideas for exploring the topic further. 138 members of library staff registered to take part in the programme and set up blogs to record their progress. 82 participants successfully completed the programme. We decided that a small incentive was a good way to encourage participants to complete the programme. CrossRef kindly agreed to sponsor the programme in order to fund the prizes. Each participant who completed all 23 Things by 9th April was given the choice of either a £10 Amazon or iTunes voucher and their names were entered into a draw for an iPod Nano. At the end of the programme, all participants (whether they completed successfully or not) were invited to take part in a survey. The response rate for this survey was 72%. Many respondents reported increased confidence in tackling something new and improved skill level in using the tools explored during the programme. They enjoyed the range of tasks and the online community that built up as participants began to read and comment on each others’ blogs. The majority of respondents said they found the frequency, duration and level of the tasks just right. An overwhelming 93% said they would recommend the programme to their colleagues. 23% of respondents to the survey said that they did not complete the programme. The main reason given for this was lack of time. Other responses were that the tasks were too difficult and concerns over privacy and the number of accounts created. In addition to the survey responses, we received feedback from the emails and blog posts from of the participants. An area that was often cited as a success was the community, both online and in our libraries, which the programme created. In the next frame is a selection of comments from the participant’s final blog posts where they were asked to summarise their experiences with web 2.0 during the course of the programme. There is no doubt that being involved in the running of the 23 Things programme at Oxford was an enjoyable and rewarding experience. It was also a great challenge. No matter how well prepared we thought we were, we still encountered some issues as the weeks went by; none however were insurmountable. One thing we were not prepared for was the unease with which some participants greeted the public nature of web 2.0. We had anticipated that signing up to Facebook would be controversial for some and therefore did not require it for completion of the task that week; however we met similar concerns with LinkedIn and modified the task to reflect this. Some participants chose to remain anonymous, and created accounts and blogs under a pseudonym. One of the most interesting aspects of the programme was its success as a training programme which staff completed at their desks. A number of participants commented on this on their blogs and expressed a desire to have more training delivered in this way. This was of particular interest as most of the training for library staff at Oxford has previously taken place in face-to-face workshops. Releasing staff to attend such workshops can be problematic, especially in libraries with a lot of part time staff. Since 23 Things Oxford, similar programmes have been run at the universities of Cambridge and Warwick. At Oxford, with so many library staff now more familiar with social media, the next step was to use these skills to create or improve the social media presence of Oxford libraries. As a follow-up, the 23 Things Team ran an event called 23 Things Summer Camp to help library staff with the Strategy, Setup and Synchronisation of their social media tools. There is great potential for the 23 Things model to be broadened to deliver not just social media exploration, but other aspects of staff development and training. The structure of the scheme allows individuals to participate at their own pace without being tied to a venue or time of day. The programme can also be differentiated to allow people with varying levels of prior knowledge to take part at a level that suits them. Have clear instructions for each week’s tasks, and keep them concise. Have specific outcomes for each task, so that participants know what they have to blog about in order to have completed each Thing. Reflective weeks and open-ended topics are OK but use them sparingly. Differentiation – participants can choose the task most suited to their experience and ability. For example, set tasks at novice, intermediate and advanced level for the same topic, so that all participants increase their knowledge, but the outcomes are slightly different. This helps to engage all staff, rather than aiming a training session at an ability/experience level. Encourage people to comment on each other’s blogs, to develop conversations and build a sense of community. Having the organisers take the lead on this helped other people to get involved too. Support the online learning with face-to-face sessions, so people who are stuck can get help. This is especially important for those who are less confident with technology in general, as they are least able to ask for help via email and may become frustrated and give up earlier than more experienced users. Focus on student-centred learning: what have the participants gained from their involvement, and can they demonstrate their new knowledge and skills? This is the antidote to traditional training in which the presenter tells the audience what they should know, but does not engage with their audience or test their learning. Thank you to the other members of the 23 Things Oxford Team: Emma Cragg, Jane Rawson, Angela Carritt and Penny Schenk; to CrossRef who sponsored the prizes and to all those who participated in 23 Things Oxford and 23 Things Summer Camp.